1. EMBL Hamburg, Notkestrasse 85, D-22603 Hamburg, Germany. 2. Section of Structural Biology, Institute of Cancer Research, Chester Beatty Laboratories, 237 Fulham Road, London SW3 6JB, UK. Published as: "Terminal assembly of sarcomeric filaments by intermolecular beta-sheet formation". Trends Biochem Sci. 34, 33-39 (2009). PubMed PMID: 18996015. The contraction/relaxation cycle of muscle cells translates into large molecular movements of several filament systems in sarcomeres, requiring special molecular mechanisms to maintain their structural integrity. Recent structural and functional data from filaments with extensive arrays of immunoglobulin-like domains have for the first time unravelled a common function of their terminal domains: assembly and anchoring of the respective filaments. The available data have also revealed a number of common principles governing terminal filament assembly. In all these cases, protein-protein interactions are mediated by antiparallel dimerisation modules, via intermolecular β-sheets. These observations provide an attractive model for several other filament proteins, which have not yet been structurally characterized. Skeletal and cardiac muscle cells are organized in sarcomeric units that form the basic compartment of the contractile apparatus . The architecture of the sarcomeric units is established by a number of major filaments, seen as characteristically shaded regions in electron microscopy images. Many of these filaments are connected and anchored either at the most peripheral area, referred to as the Z-disk, or within the central region, the so-called M-band, which divides each sarcomeric unit into two mirrored halves. We have recently outlined some of the emerging molecular principles that define how sarcomeric filaments are assembled, connected and anchored . In this summary we focus on some of the recent key achievements from our laboratory on the self-assembly of two sarcomeric filament proteins, titin and myomesin. Perhaps the most remarkable and unexpected filament assembly complex has been found at the N-terminus of titin . Complex formation of titin with the scaffold protein telethonin was initially considered to be binary, and a telethonin function as a “cap” or “bolt” was proposed . The structure of the titin/ telethonin complex, however, revealed an assembly with 2:1 stoichiometry, in which one telethonin molecule mediates an antiparallel arrangement of two titin filaments (Figure 1, left). In the presence of titin, telethonin forms a central β-sheet that is flanked by two wing-like b-hairpins with related sequences and structures. These telethonin “wings” generate a total of four binding sites, thus exhibiting a unique palindromic arrangement of titin with internal two-fold symmetry . Comparison of the structures of the titin N-terminus in the absence and presence of telethonin [3,5] reveals that telethonin rigidifies the titin Nterminus, in addition to its function as an assembly mediator. All three known members of the myomesin filament family are localized in the central M-band of the sarcomere and display a closely related domain organization . Immuno-electron microscopy data indicated that the orientation of the C-terminal region of myomesin is parallel to the principal filament orientation in sarcomeric units . 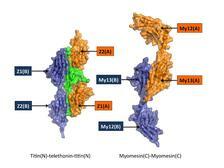 Biochemical data revealed that myomesin assembles into a dimer via its C-terminus . A recent crystal structure of the two myomesin C-terminal lg domains 12 and 13 showed that the assembly has a direct and antiparallel arrangement, forming an end-to-end filament structure across the central M-line of sarcomeres  (Figure 1, right). The assembly involves two surface patches from Ig domain 13, one of which leads to the formation of an intermolecular β−sheet and the other which is formed from a number of specific side-chain interactions. The linker next to IG domain 13 is of substantial length (~20 residues) and folds into an a-helix, which is not involved in further dimer assembly interactions, thus demonstrating that terminal assembly in myomesin is restricted to Ig domain 13. Sarcomeric filament proteins belong to the largest gene products of the human genome. Because of their large size and flexibility, it is not possible to apply conventional structural biology methods for determination of their structures. Within the projects presented, we have mostly made use of methods that are provided by EMBL-Hamburg; X-ray crystallography and Small Angle X-ray Scattering (SAXS). We anticipate that their use will become even more powerful once our new beamlines at PETRA III have started operation. In present unpublished projects, we have also included electron microscopy. As shown by recent data on the titin/telethonin complex, steered atomic force microscopy presents a powerful tool to test the elastic properties of the assemblies investigated . In addition, there will be increasing need to test new structural data obtained with purified protein components by in vivo functional assays and imaging methods. We hope that the future Centre for Structural Systems Biology (CSSB) will allow us to fill this gap seen at present research infrastructures. J.M. Squire, H.A. Al-Khayat, C. Knupp and P.K. Luther, "Molecular architecture in muscle contractile assemblies", Adv. Protein Chem. 71, 17-87 (2005). N. Pinotsis, P. Abrusci, K. Djinovic-Carugo and M. Wilmanns, "Terminal assembly of sarcomeric filaments by intermolecular beta-sheet formation", Trends Biochem Sci. 34, 33-9 (2009). 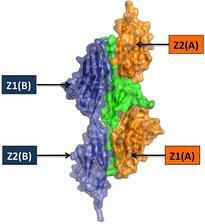 P. Zou et al., "Palindromic assembly of the giant muscle protein titin in the sarcomeric Z-disk", Nature 439, 229-33 (2006). C.C. Gregorio, H. Granzier, H. Sorimachi and S. Labeit, "Muscle assembly: a titanic achievement? ", Curr Opin Cell Biol 11, 18-25 (1999). M. Marino et al., "The Ig doublet Z1Z2: a model system for the hybrid analysis of conformational dynamics in Ig tandems from titin", Structure 14, 1437-47 (2006). R. Schoenauer, S. Lange, A. Hirschy, E. Ehler, J.C. Perriard and I. Agarkova, "Myomesin 3, a novel structural component of the M-band in striated muscle", J Mol Biol 376, 338-51 (2008). W.M. Obermann, M. Gautel, F. Steiner, P.F. van der Ven, K. Weber and D.O. Furst, "The structure of the sarcomeric M band: localization of defined domains of myomesin, M-protein, and the 250-kD carboxyterminal region of titin by immunoelectron microscopy", J Cell Biol 134, 1441-53 (1996). S. Lange, M. Himmel, D. Auerbach, I. Agarkova, K. Hayess, D.O. Furst, J.C. Perriard and E. Ehler, "Dimerisation of myomesin: implications for the structure of the sarcomeric M-band", J Mol Biol 345, 289-98 (2005). N. Pinotsis, S. Lange, J.C. Perriard, D.I. Svergun and M. Wilmanns, "Molecular basis of the C-terminal tail-to-tail assembly of the sarcomeric filament protein myomesin", Embo J 27, 253-64 (2008). M. Bertz, M. Wilmanns and M. Rief, "The titin-telethonin complex is a directed, superstable molecular bond in the muscle Z-disk", Proc. Natl. Acad. Sci U S A 106, 13307-133310 (2009).